Magic Jack Technical Support Any SMS/texting with Magic Jack in Canada? magicJack Tips, Tricks, and Hacks Softphone or ATA adapter/land line: Which is better quality? Magic Jack Technical Support MJ chat told me they don't support ORIGINAL MJ device ! magicJack Plus Support [ Poll ] Constant Clicking. Magic Jack Technical Support Should there be 2 instances of Handset? Magic Jack Technical Support How do I improve MagicJack call quality? magicJack Tips, Tricks, and Hacks MagicApp on iPhone 3gs ? 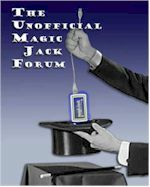 magicJack Tips, Tricks, and Hacks I wonder as Spoofcard working with magic jack ? magicJack Tips, Tricks, and Hacks Anybody have a copy of TjInit1200.exe? Magic Jack Technical Support Magic Jack App issue when using Call Forwarding! magicJack Plus Support Amazing little portable router -may be useful with MJ+ too? Magic Jack Technical Support Can Magic Jack connect to IP phone? Magic Jack Technical Support Call forwarding question? magicJack Plus Support Anyone getting delayed voice messages?